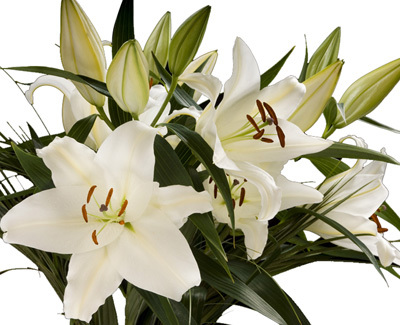 The white Oriental Lily symbolizes purity and holiness. The beautiful bloom opens out to form an elegant star shape revealing its striking stamen at the center. The white Lily spreads its beautiful fragrance, the Queen of Flowers, will offer more then just decor to your special occasion. Our farm fresh Lilies will be delivered to you at wholesale rates.